A light object consisting of 22 slices of trans­parent poly­car­bonate, stacked hori­zon­tally on top of each other. The narrow sides of each slice are circum­scribed by a neon strip illu­mi­nated in turquoise blue. Mounted close together, they form the shape of a stylised cloud. 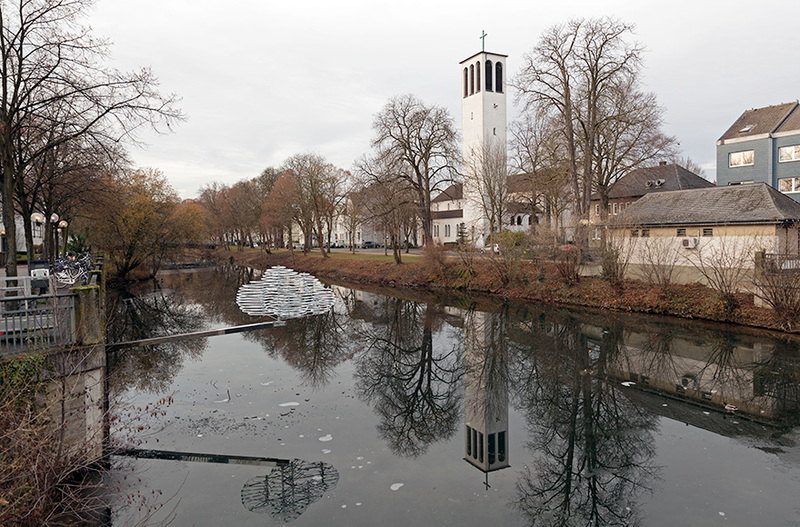 This cloud is located at the tip of a cross­beam fixed to a bulk­head above the river Lippe. Moved by the wind, the cloud rotates around its own axis. The cross­beam has a total length of 550 cm, is clad in chromium-plated steel sheet and is swivel-mounted. 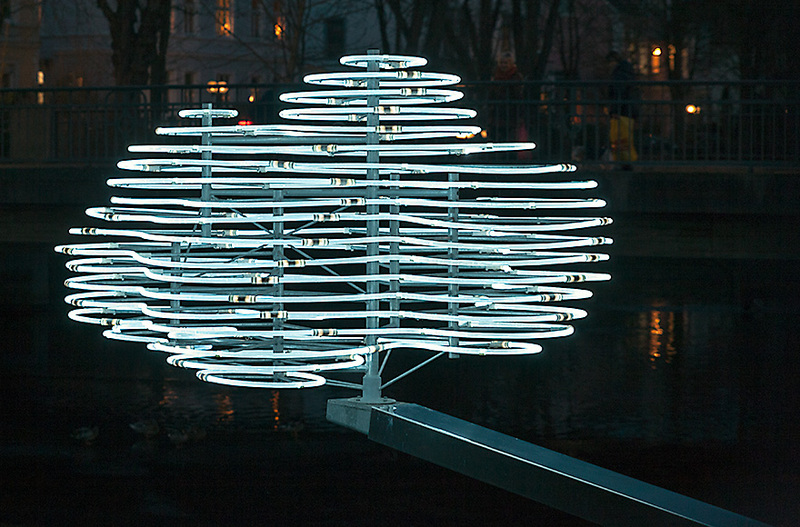 The neon cloud itself measures 220 x 120 x 130 cm. The work marks the town’s former north gate, which is situ­ated oppo­site the munic­ipal theatre. Depending on the weather, the mate­rials either reflect the sunlight or are less visible when it is over­cast. 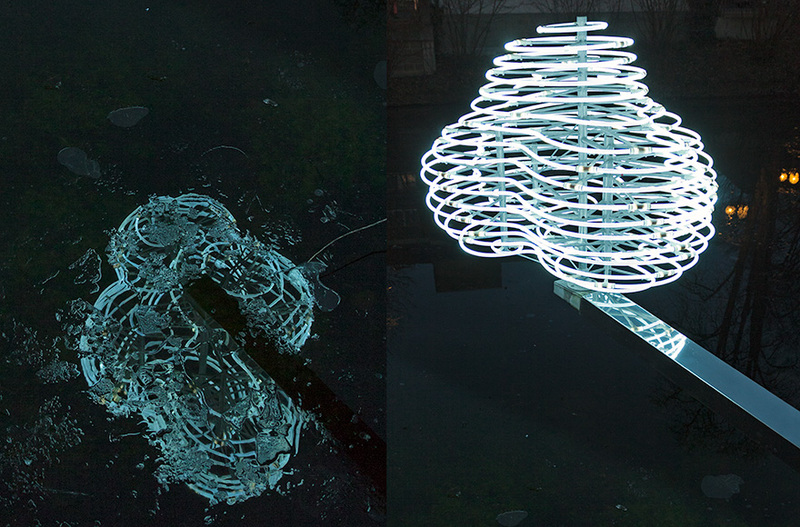 During the day, sunlight is reflected on the surface of the water, at night blue neon light. The hori­zontal neon contours are direct sculp­tural repre­sen­ta­tions of drawn hatch­ings, as seen in draw­ings of clouds on medieval maps. 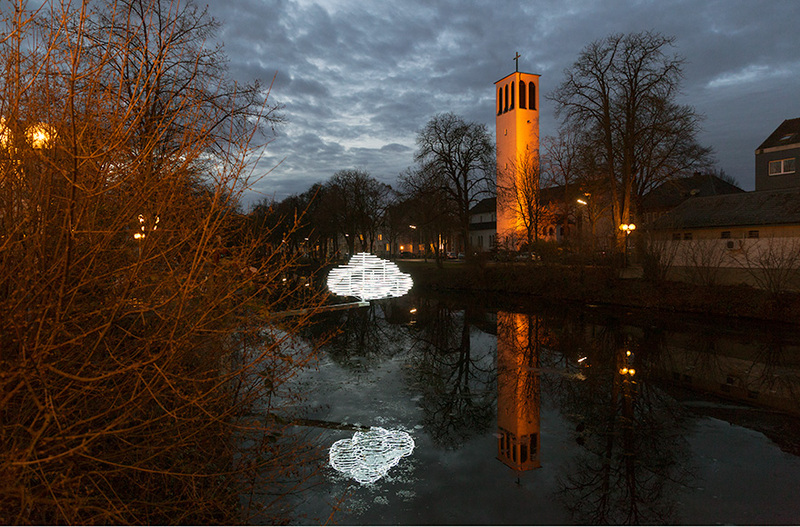 Drawing, object and light instal­la­tion combine so that the trans­formed drawing of a cloud, here as a real and illu­mi­nated object, accen­tu­ates the urban space. By being arti­fi­cial, the object is highly poet­i­cally attrac­tive to the observer. As an everyday natural phenom­enon we are familiar with clouds. They are used as a symbol or an alle­gory of human feel­ings: there are “dark clouds in the sky” or “we are on cloud nine”. Clouds are used as metaphors for the after­life, for wander­lust, infinity and freedom of thought— for long­ings in general.